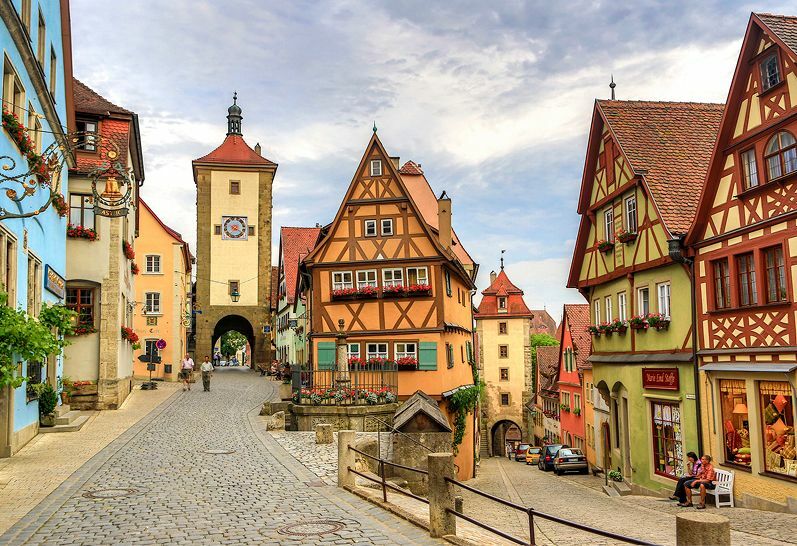 Medieval Rothenburg has a fairy-tale charm. When I told friends that I was going to spend a few days in southwest Germany visiting historic castles and churches, most responded, “It’s so romantic there!” said Diane Daniel in The Boston Globe. Why did they all say the same thing? My wife and I discovered the answer when we arrived in Germany’s Tauber River valley and were greeted by signs everywhere for the Romantische Strasse, or “Romantic Road.” Unwittingly, we had planned a cycling trip that’d trace roughly 62 miles of one of the country’s most well-marketed driving routes. The road, biking trails, and the region’s rail lines all follow the Tauber River, a gentle tributary more often than not canopied with willows. Terraced vineyards cover many of the surrounding hills. The tourist board could have told us we were following the “cute-cuter-cutest” route. Wertheim am Main, our first stop, has a maze-like medieval town center and a steep 10-minute walk took us to the 12th-century Wertheim Castle, “impressive from below and above.” The next day, we cycled on gently rolling hills above the Tauber—heeding road signs that warned of toad crossings—to reach the Bronnbach Monastery, whose tucked-away church dazzled us with its 18th-century Baroque altars. We spent that night in Markelsheim, an “adorable” historic town known for its walking trails and wine stores. During our stay, a maypole was being decorated in the square, where the town’s 2,000 residents would soon gather to share food and drink before hiking the hills together.